I liked the Darkling’s character. His character seemed to be a perfect balance between evil and good. Bardugo did a nice job characterizing him. I hated the main character, Alina. She was your typical naive character who had no idea what was happening. She acted confident but she was lying to herself. I rate this book 7/10 stars, because the story was amazing and the world was captivating. The only thing I hated were a few of the characters. I kept reading because I loved the story and I wanted to see what would happen with Alina and the Darkling. It was so beautiful and rich that I couldn’t put it down. The world Bardugo created was so captivating that I had to keep reading. The twists kept me on the edge of my seat. This entry was posted in Read This!, Teen Powered and tagged bysplteens, fantasy, Green Lake, lean mean teen reviews, Teen Book Reviews, written by teens on May 13, 2015 by Teen Blogger. Today, though, we want to recognize the winning school (with braggin’ rights and a championship banner) and the grand-prize winning reader (with a Kindle Fire HD!). And the grand-prize winning reader is… Elizabeth from Montlake. Elizabeth read (for all six hours…see a trend?) at Green Lake and had a great time at the Reading Marathon. 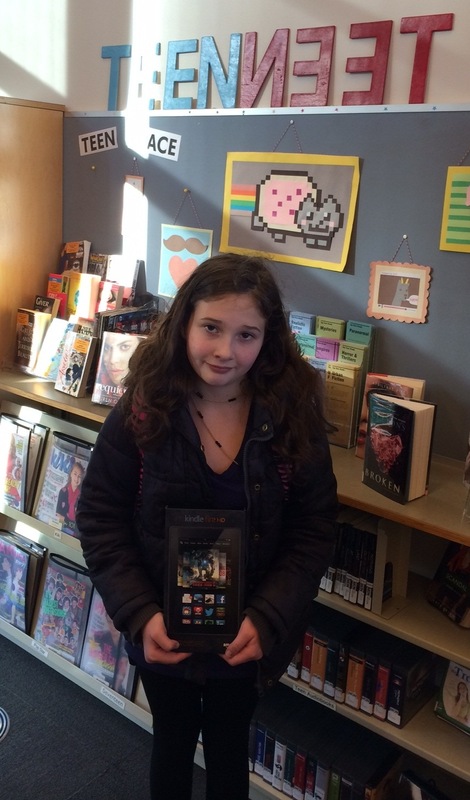 We hope to have more from Elizabeth soon, but for now, she wants to say how happy she is to win the prize & how much she thanks the library…and thanks to you, Elizabeth, for reading, representing your school, and coming to the library! 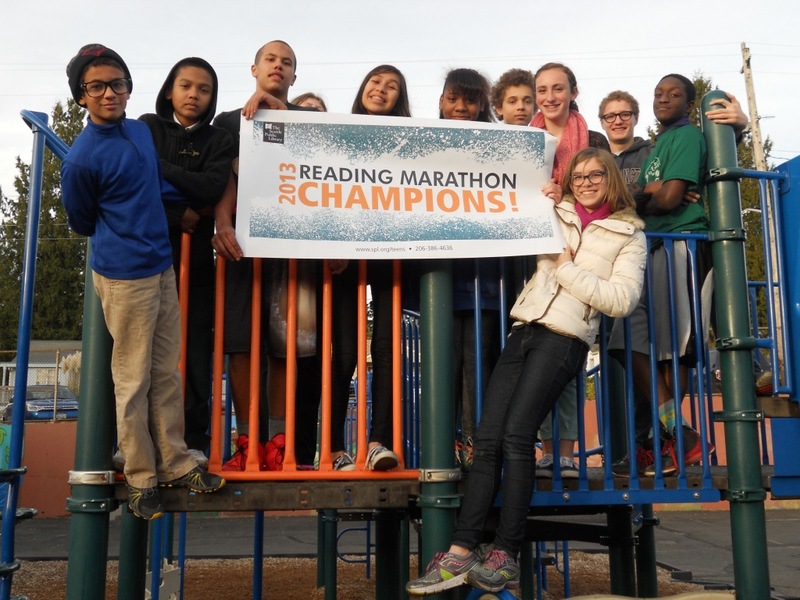 The Reading Marathon was a huge success… all over the city. 315 teens participated between the six locations and read a whopping 1815 hours! We couldn’t be happier with the awesome turn-out. Did you attend the Reading Marathon? Any stories or thoughts about it? Want to share what you read or are reading now? We’d love to hear from you! Way to go, Seattle-area middle schoolers. That was a crazy good time. Hope to see you next year! This entry was posted in Community, Contest, Events, Libraries, Read This!, School News, Teen Powered and tagged Green Lake, Montlake, Pinehurst, reading marathon on December 3, 2013 by Rae. Join us for a Sundays are Special celebration! @ Green Lake today from 2 – 3:30pm! 15 branches have new Sunday hours and we’re celebrating at each location with the Check-Out Challenge, refreshments and crafts. Thanks to the passage of the Library levy, 15 more branches will be open on Sundays from 1 p.m. to 5 p.m. beginning in 2013. That means that every Library location will be open on Sundays. Sundays are Special celebrations feature refreshments and a craft event for families, along with the Check-Out Challenge game and information about new Library services. Pick up a Check-Out Challenge game card. Visit any Library location on Sundays between Jan. 6 and May 5 to get your card stamped. Patrons with 15 stamps can enter a prize-drawing for a chance to win a book lover’s basket and lunch with the city librarian. New cards feature iconic images of Seattle and an illustrated card designed to appeal to children! This entry was posted in Community, Events, Food, Libraries and tagged celebration, Green Lake, Library Levy, Sundays on April 7, 2013 by pushtotalkteens.